After reading the latest post on Rogues and Reavers about Marvel '78, I got all excited about coming up with an original character concept. 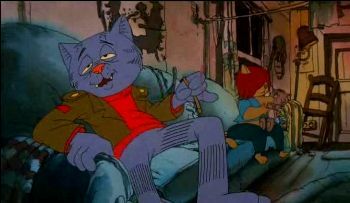 The tone is late-century Eastern urban decay, so my head stirred up Welcome Back Kotter, Fritz the Cat, Barney Miller and Wolfen. This is what came out. He's cool. He's smooth. He's covered with fur. The sunglasses he dons aren't just for the ladies. His cat-vision eyes need shade from the dirty lights of a hot New York City night. He doesn't just fight the criminals who take advantage of the people, like the Junkyard Dog. No, he also fights The Man. He's not just one color, baby - he's full-on calico!